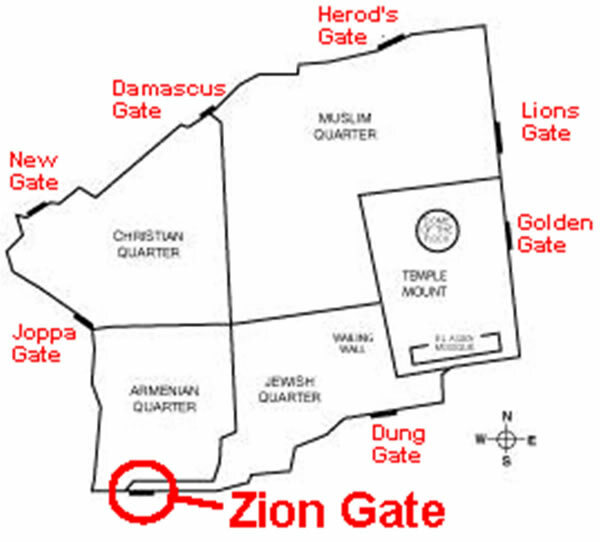 The Old City of Jerusalem has eight gates in its walls. 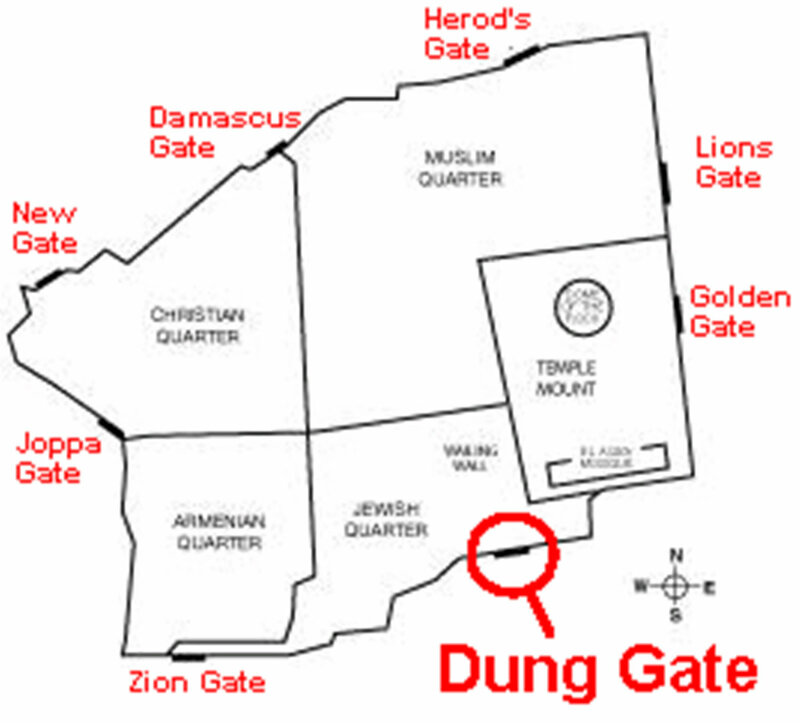 Suleiman’s original walls had six gates: Damascus Gate, Herod’s Gate, Stephen’s Gate, Dung Gate, Zion Gate and Jappa Gate. 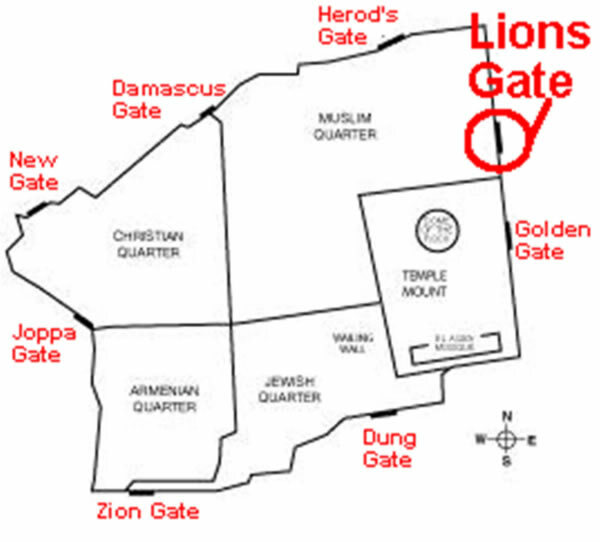 The gates were all designed and built to have an L-shaped entry instead of a straight line of entry. Taking this sharp ninety degree turn would have slowed down an invading army in the final moments of a siege. The “L” turns have been removed from Stephen’s Gate and the Dung Gate to better facilitate modern traffic but can still be seen in the other four gates. 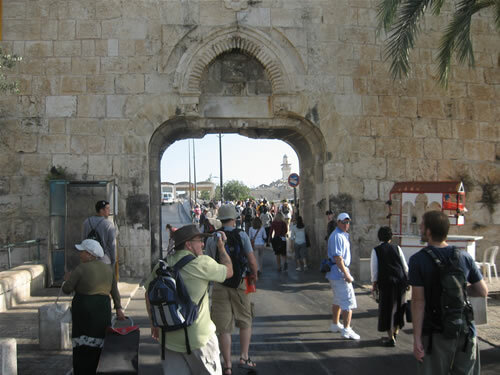 Watch Galyn's video "Jerusalem's Gates"
The present name of this gate is the Jaffa Gate since it leads to the port of the city of Jaffa (which is also known as Joppa, so it is sometimes called the Joppa Gate). 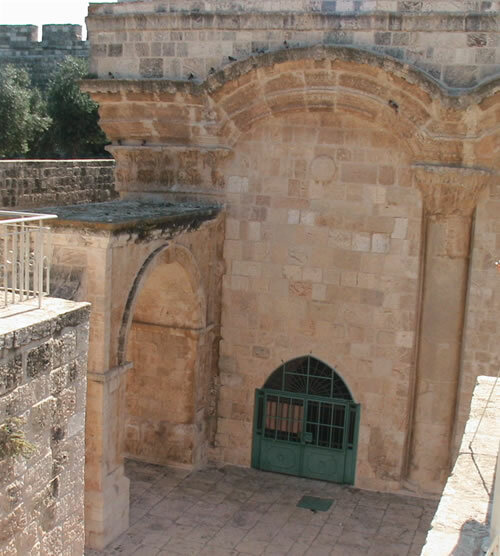 It was originally called Bab el-Khalil, or “the Gate of the Friend,” since it opens towards Hebron which is where Abraham, the friend of God, came from. 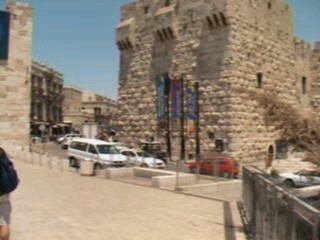 In the photo above, the Jaffa Gate is on the left and the Citadel on the right. The wall south of Jaffa Gate (in between the gate and the Citadel) was removed in 1898 by the Ottoman sultan Abdul Hamid II to allow his ally Kaiser Wilhelm II of Germany to ride into the city in his carriage. The moat, which was located where the road is now, was also filled in at that time. 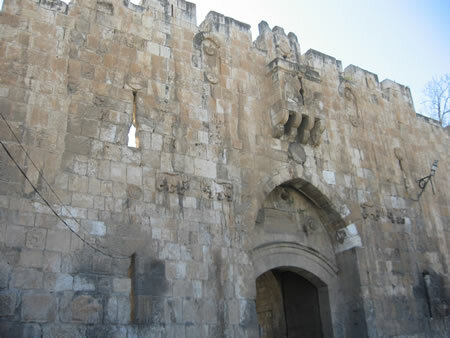 The sultan did this to give the Kaiser the impression that he was entering Jerusalem through the Jaffa Gate when really he was not, since there is a legend that says all conquerors will enter through the Jaffa Gate. In 1917, the British General Edmund Allenby entered through the Jaffa Gate on foot and gave a speech on the steps of the Citadel. The Jaffa Gate was the focus of Israeli forces in 1948 as they tried to capture the Old City in order to unite it with Israeli-controlled western Jerusalem. However, the Jews did not gain control of it until 1967. Between 1948 and 1967 the Jordanians could not use this gate for traffic so they had to widen the Dung Gate to get access the Old City and its Citadel. Toni walks past the street vender selling his bread one evening and into the Jaffa Gate from outside the walls of the city walls. slowed down invading armies after they had broken through the entrance to the gate. Looking at the inside of the Jaffa Gate. To exit the city through this gate a person enters the gate and turns right. and it continued around the citadel located to the left of this photo. The moat was filled in 18 years after this image was drawn. A view of the citadel from the outside of the city wall. A portion of the Joffa Gate can be seen to the left. 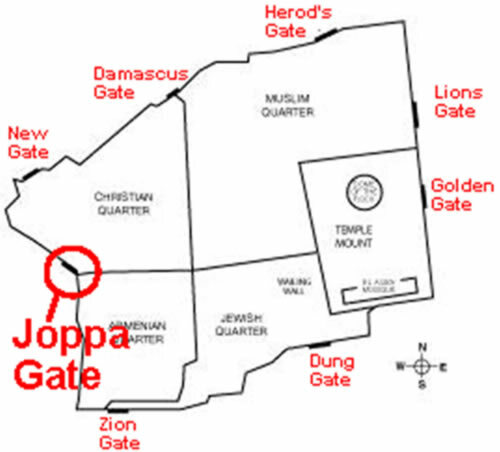 Joffa Gate on the left. 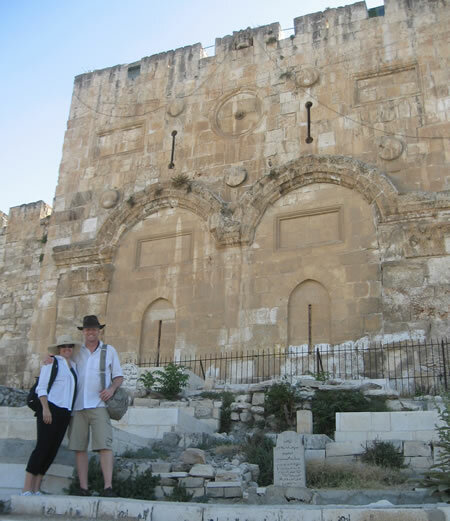 these walls), so they could have easy access to the Church of the Holy Sepulcher. A view looking out the New Gate from inside the city. A view looking into the city through the New Gate. The Damascus Gate is the most impressive of Jerusalem’s gates. 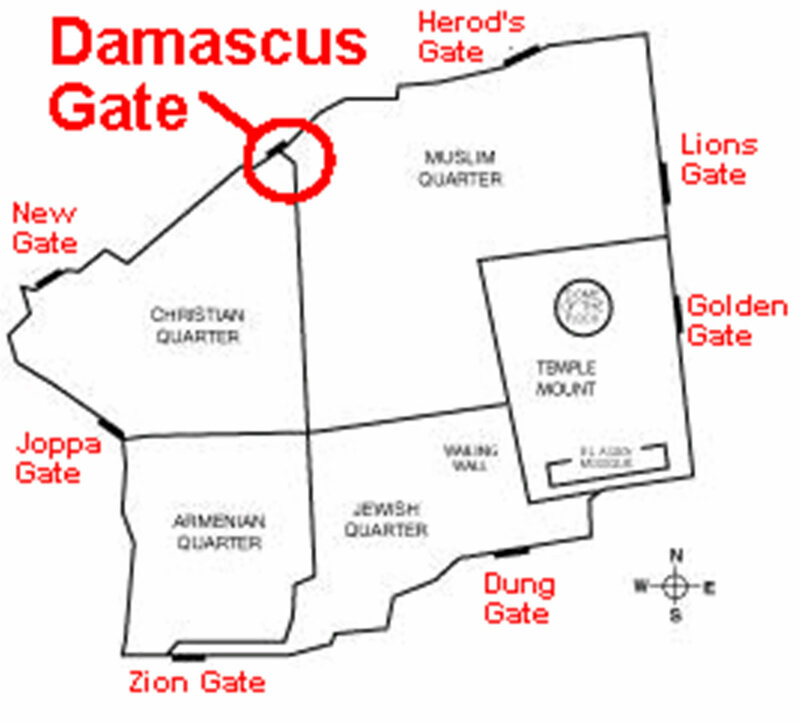 It is called Damascus Gate because the road coming out of it leads in the direction of Damascus. The Arabs call it the “Gate of the Column” (Bab el-Amud), a name that preserves the memory of a large column that once stood inside the gate, as seen on the Madaba map. Two towers stand on each side of the gate prepared for battle, and a very busy Arab bazaar (marketplace) is crowded and active just inside the gate. The location of this gate today marks the location of a major city gate from when Herod Agrippa expanded the city walls in 41 AD. The bridge leading into the gate spans an area excavated by the British between 1917 and 1947 where the first and second century gates were found. (This is an example of what might be found under today’s Golden Gate if it were allowed to be excavated.) 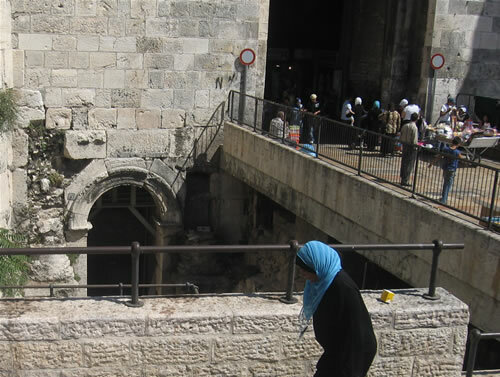 Excavation under the Damascus Gate revealed an ancient gate system from 41 BC. Here is one of the pedestrian entrances to Jerusalem built by Herod Agrippa II from 41-44 AD. The arch is a reconstruction completed by Hadrian in 135 AD. 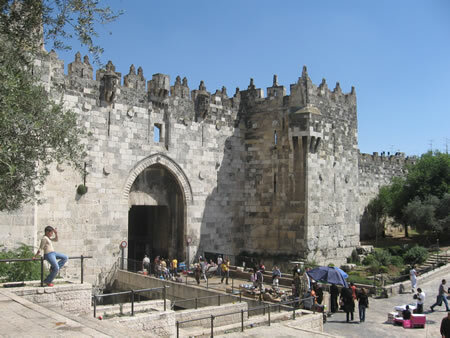 The Damascus Gate is the most elegant of the Old City gates. and on the inside (see below) of the street that runs through the Damascus Gate. stones from the first century. Hadrian (or, an emperor who followed him) placed a large victory column in the middle of the plaza on the inside of this gate. This column, the plaza and the Nea Gate can be seen on the Madaba map. Gate. This pedestrian gate and its tower date from the time of Herod Agrippa I’s expansion of the city walls to the north and west in 41-44 AD. He built a larger gate and this smaller gate at this location. The main walls and gate were destroyed by Hadrian in 135 AD, but this smaller pedestrian gate, its tower and molding on the lower half of the gate and the molding along the base of the tower still remain from Herod Agrippa I’s original work in 41 AD. The arch and capping stone are from Hadrian’s restoration in 135 AD. stones of the door jamb and of the wall are from 41-44 AD. A street sign that is typical of street signs in the old city. They are made of tile and are written in Hebrew, Arabic and English. turns left to walk through the gate and then turns right to walk out of the gate. This is a view inside the Damascus Gate. past the street venders. I will turn right to exit the gate and leave the Old City. was actually a Mamluk house, and Herod’s palace was in the Citadel on the west wall of the city just south of the Jaffa Gate. The opening we see today was actually cut into the front of the gate in 1875 by the Ottoman Empire. Originally the gate was entered from the east (left) through a small door in a larger door (wicket gate) which was rarely opened. The road leading to this gate cuts through a 2000-year-old aqueduct, which can still be seen on the west (right) side of this gate by locating the aqueduct’s covering stones. 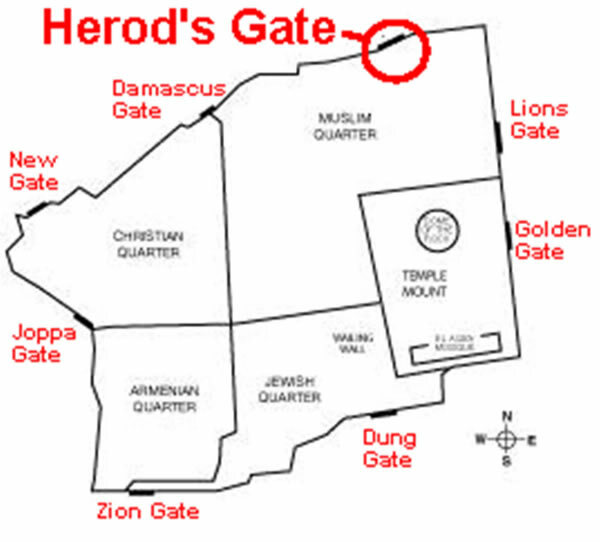 Herod's Gate, or the Flower Gate, sits in the north wall of the Old City. 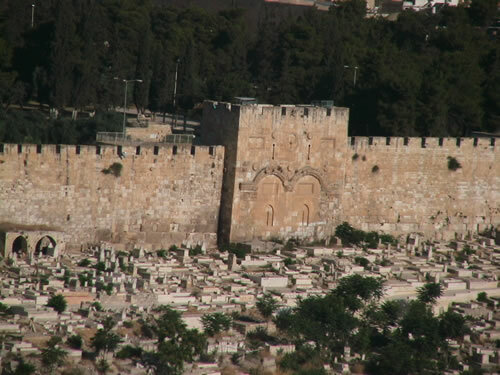 An earlier tradition associates the north side of the city as the place of Stephen’s stoning. 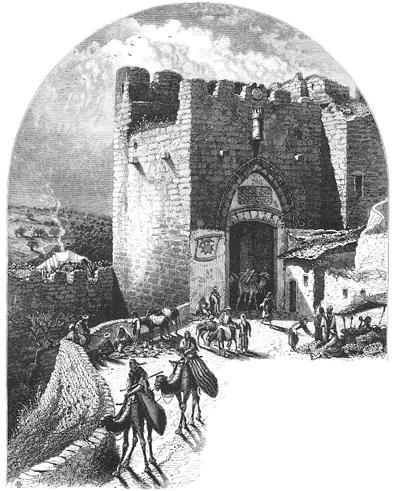 It was also named “The Jordan Valley Gate” (Bab el-Ghor) by Suleiman. Notice the two carved lions on each side of the gate. 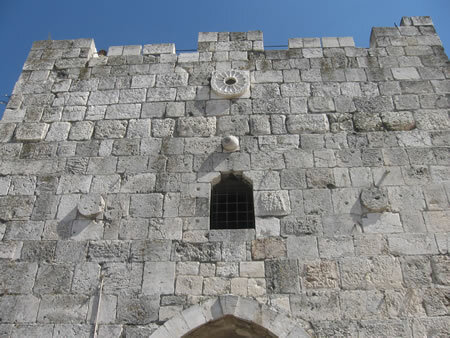 The protruding stone work above the gate is for pouring burning oil down on the enemy who is trying to break in the gate. Arrow slots are visable like narrow windows. original exit from the gate into the city can be seen. See this in the photos below. Details of the lions on the left side of the Lion's Gate. twenty years before the walls and gates were built. Even though the lion is a symbol of Jerusalem and Judah, it is also possible that these lions were placed here to honor the Mameluk Sultan Baibars (1123-1277). 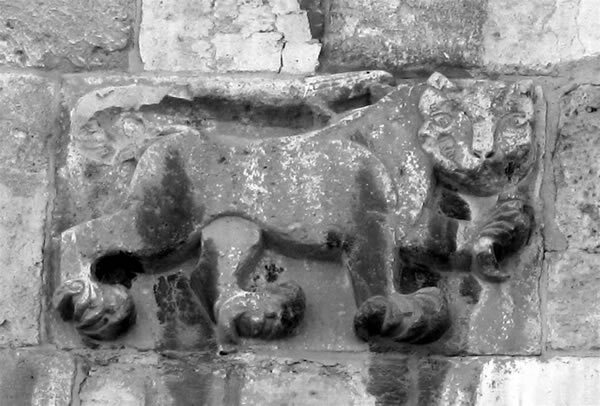 Details of the lions on the right side of the Lion's Gate. Black/white photo of one of the four lions. Looking through the Lions Gate from the inside at the Mount of Olives. Standing in the original interior of the gate. The bumper of a car driving through the gate into the city can be seen. Top of the exterior of the Lions Gate. as they would try to break down or burn down the gate. 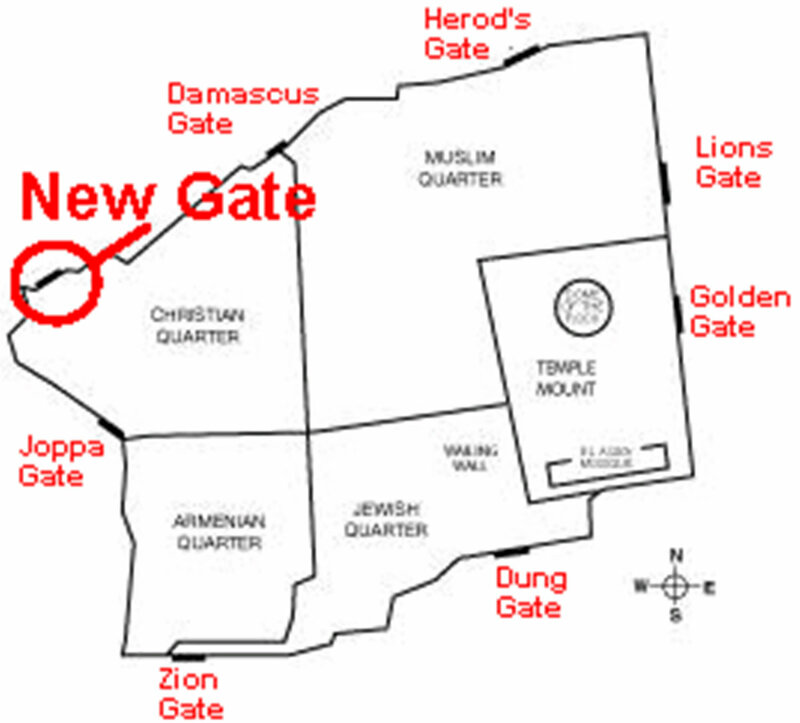 gate has not been unblocked since the Crusaders lost control of Jerusalem. Arab graves fill the space in front of the entire length of the eastern wall. Golden Gate, the ground beneath his feet gave way and he dropped into a hole about eight feet deep. came into our English language known as the Golden Gate instead of the Beautiful Gate. Muslim graves surround the Golden Gate. 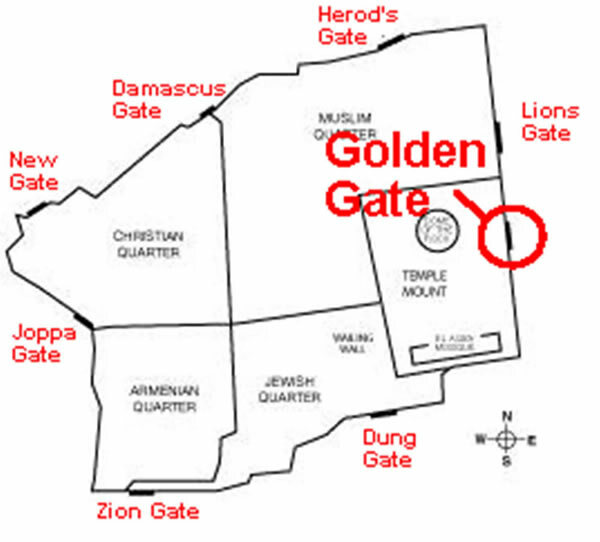 The Temple Mount is on the other side of the gate. as I take this photo. Gate, and this may be how the gate got its name. 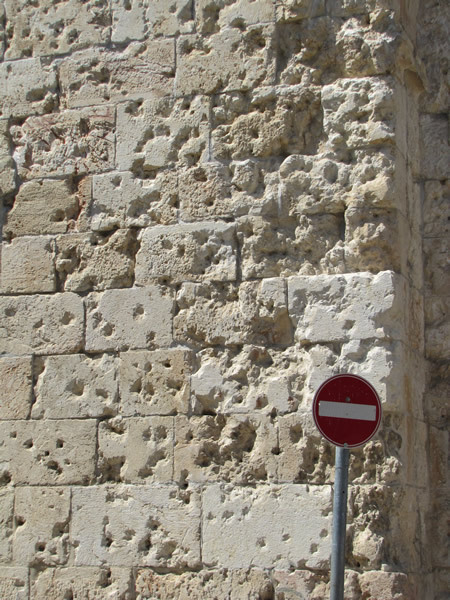 Zion gate is riddled with bullet holes from the War of 1948. 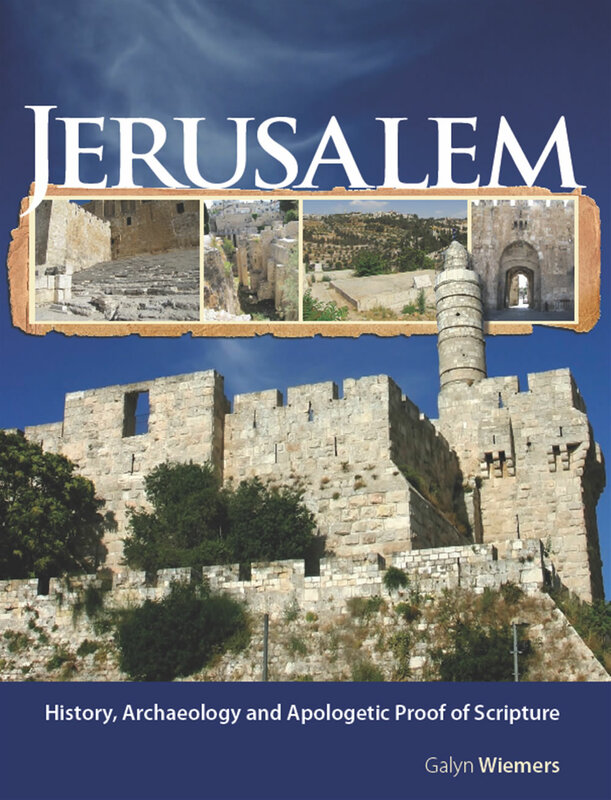 Jerusalem, which was controlled by Israel. Toni studies the bullet riddle stones of the Zion Gate. Standing inside the walls of the Old City looking at the inside of the "L" shaped Zion Gate.